Story behind your band/artist name: Kitchen Noise started as a Cory Foley-Marsello's solo recording project. When he first moved to the DC area, he set up a small studio in the basement of a group home, right below the kitchen. Often as he was recording. the sounds of friends cooking and cleaning would trickle down the stairs. Kitchen Noise earwormed it's way into his head during these years, and stuck. -- Cory Foley-Marsello is a Washington, DC-based audio engineer who started getting some ideas out alone in the studio after everyone had gone home. Originally playing everything on his first album Ceramics, he soon recruited talented friends to help him recreate the songs, and eventually work on new material. Joined by Matt Krist on bass, Andrew Toy on drums, and Jay Hardin on keyboards, the sound was given more structure. Cory's guitar work, still leads the band, but the added layers and rhythm create a heavier sound with cacophonous peaks, and hushed atmospherics. Later, Cory's future wife Kim Nelson joined the band, and her voice was the perfect compliment to his novice and untamed rasp. After wrangling their sound for the stage, and arranging a batch of new material, Kitchen Noise went back to the studio where everything had begun. This time with a full band, their new album The Host is a complete statement. The result is an archeological dig through layers of dusty guitar lines, heavy drums, and layers of rich organs and synths. The song Shadows represents the sound best, as it starts with muted fingerpicked guitars, and ends with a raucous, climactic guitar solo. It's a simple song that finds its power in the details of the playing and production. Each section has new layers that propel the song forward, through rich textures and blurry ambience. Mountain Home closes out the album, and finds Kitchen Noise at their most recognizable and straightforward. A country-tinged tune hits with a catchy chorus, before settling into an outro that builds to the band's most climactic moment, before it falls back to earth with a tender truth -- "Everything that you can see will be, yours and mine..."
Band Members: Cory - Guitar, Banjo, Vocals. Kim - Vocals. Matt - Bass. Andrew - Drums. Jay - Keyboards, Vocals. What part of the DC region is the artist tied to and how? Where is the artist's current home base if not DC : I live in the North Michigan Park neighborhood in NE DC. But we practice in College Park at Andrew's home. Jay lives in Takoma Park, and Matt is the odd man out, from Baltimore. At least 3 interesting/entertaining facts about the band related to persons/events in Washington DC area:I've been a local audio engineer for 10 years. I first worked at Bias Studios in Springfield, VA. Which is where we record as well. I now work in Post Production, but still work with other local bands in my free time. I met my wife Kim, who now sings in the band, here in DC. Andrew Toy, is a local fixture in the DC drumming scene. He's an amazing teacher, and we are very lucky to have found him. Anything else we should know, or you want to share: We've recently released our new album "The Host". And we have a show coming up at the Velvet Lounge on 1/20. Story behind your band/artist name: The name 'King Leisure' is a commentary on the idea perpetuated now that there's one 'best way' to spend your downtime. People are constantly telling you that you HAVE to watch a show; this idea that one leisure activity is superior to another. As a connection to the past too King Leisure jokes that royal free time was somehow higher status, though as we all know: fun is fun. What part of the DC region is the artist tied to and how? Where is the artist's current home base if not DC : We are all from the DC and Maryland Area. Members grew up in different parts of Montgomery County and were raised on a steady diet of going to see shows in D.C. Currently are spread out across the DMV with members calling Virginia, Maryland, and Metropolitan DC home. - Band Members include an Active CPA in the State of Virginia, A GW Law Student and Future Securities Lawyer,an IT and Security Analyst, and a full-time Psychology and Accounting student at American University. Though we're not all on the same path through music and live performance we continue to speak the same language and share common goals. Anything else we should know, or you want to share: Thank You for Your Consideration!! Story behind your band/artist name: I started as a street musician. A video of my guitar playing was seen by the Virginia Tech Marketing team and I was asked to headline as Men's basketball halftime show with my guitar playing. I have done a number of other halftime shows for various schools and play a lot locally in the DC area. 2. I lived in a small southern African country called Swaziland for over a year. 3. The most interesting music gig I have had was being asked to perform my guitar routine on a party bus for a group of radio producers. Was really interesting trying to play my guitar while on a moving bus that was driving all around the U Street area. Anything else we should know, or you want to share: My name is Kevin. I am a 25 year old musician from the Washington DC area. My music 'career' began with some simple street performances while at college to try to make some extra money. A number of people would take videos and someone from the VT marketing team saw my style of guitar and asked if I would like to headline a halftime show. It was an amazing experience and since then I have been very fortunate to be asked back and have been invited to other schools to perform as well. I also play a lot locally with my solo act as well as the small rock band I also play in. I love the DC music scene and there are so many more places in the area that I hope to be able to play at some day! Story behind your band/artist name: Loi Loi is my Cantonese surname. The character for “Loi/lu” is one smaller box on top of a larger box. In Chinese, a box is a measure word for a person. When I started the band, there were four people and so it made the case for naming the band after...me! Anything else we should know, or you want to share: Our next album comes out on 11/10! We are opening for fellow synthpop warrior Bright Light Bright Light, who is on tour right now with Erasure. Recommended if you like: We aren't sure to be honest, but we are open to suggestions of what you think. Story behind your band/artist name: We were initially called Daniel and The Lions, but there were way too many of those. So we back tracked to "Lion" and wanted to focus on that, and it turns out that not many people use Latin anymore so we paired a well-known constellation with a not-so-well-known constellation. So I guess in a nutshell, we stumbled into a name and eventually embodied it. At least 3 interesting/entertaining facts about the band related to persons/events in Washington DC area: -Daniel and I went on our first man-date to the zoo many a years ago when we first met. We loved the bears. -We've had our sweatiest/coolest show in DC via house show. -We've met some the coolest, and most community-wound musicians in the DC scene. Recommended if you like: The vocalists/songwriters who’ve had the biggest influence on me are Mark Hollis (Talk,Talk), George Harrison, and Robin Pecknold (Fleet Foxes). I’ve been told my vocal tone is probably closest to Peter Gabriel’s. Some specific examples of songs that exemplify the sound and spirit that we’re trying to achieve include: “George Harrison - Let it Roll/Ballad of Sir Frankie Crisp” “Talk, Talk – New Grass” “Fleet Foxes – Meadowlark” and “Peter Gabriel – Mercy Street”. Jack Kerouac is another great influence, with his beatific, exalted prose; the rhythm and cadence of his voice almost like a trumpet or sax in a jazz band. I think Mark Hollis (Talk, Talk) achieved this vocal style on both “Laughing Stock” and “Spirit of Eden” albums. Listen to his vocals on the song, “Inheritance” and the lyrics – (April Song, Lilac glistening foal, Ten as one, On the breeze they flow, When it gets my heart out, it gets my heart out...) That’s what we (The Lantern Slides) are trying to realize in our music with songs like: Big Sur, Juniper Cathedral and Pear to Bear. Story behind your band/artist name: The Lantern Slides invokes a different visual experience for everyone. It works both as an action verb and a passive noun. Prior to the advent of photography, magic lanterns were used in the 17th Century to illuminate painted glass “lantern slides” to tell stories and entertain. When I introduced the band name to my brother, Joe (our drummer) he immediately saw a swaying lantern on an old sailing ship, casting it’s light through the darkness of a storm. He saw the lantern literally sliding around in the dark. My cousin, Weston just refers to us as “the slides” like something he sees kids swooshing down on a playground. What part of the DC region is the artist tied to and how? Where is the artist's current home base if not DC : DC has always been home and we've played at Velvet Lounge, DC9, IOTA, Jammin Java etc. Grew up in Fairfax,VA. Currently reside in Gainesville, VA.
At least 3 interesting/entertaining facts about the band related to persons/events in Washington DC area: Our very first headlining gig was a freebie - no pay show - at Axum's Lounge in NW DC (now permanently closed). No air conditioning in the middle of summer. It was right next to an awesome Ethiopian restaurant that just filled the little upstairs bar/stage room with spices. Our drummer setup his kit in a glorified broom closet and the rest of us literally stood on top of each other sweating like crazy but we had the greatest time of our lives drinking beer and playing with other local bands to include Tony Porecco (Black Checker) and now Uptown Choir Boys. It was such a pure experience. Just music and beer. Everyone was there to experience music in the moment and it was the beginnings of something for us, where we stepped through this door and joined a community that night. It was good. Anything else we should know, or you want to share: We're primarily a recording project at the moment due to growing families and obligations. We do all our recording at a home studio at Gainesville, VA with a Focusrite Saffire Pro 40 interface. Story behind your band/artist name: My new original project is called Brave Like Us. At least 3 interesting/entertaining facts about the band related to persons/events in Washington DC area: Laura and Jay are both left handed. Play instruments right handed. Laura is classically trained on the violin. Story behind your band/artist name: We started off as Nasty Women, then when that became a bit too commercialized, we thought about switching it to Lavender Scare (historical phenomenon similar to red scare, look it up), but after discussing it as a full band decided to shorten it to Lavender for simplicity and to sound less like we might be a punk band. - Auditioned and made it to Hollywood on American Idol 2 separate times, made the top 50 both times, one cut shy of being on the live show. - Luke won the Arlington Independent Media competition "The B-Side" at the end of last year! Story behind your band/artist name: Chris and Patrick grew up with comics and are big fans of the medium. They chose the name Motion Lines--the technique used to depict movement in comics. In comic terms, Motion Lines are sometimes called movement lines, speed lines, or action lines, but I guess those names weren't as appealing. What part of the DC region is the artist tied to and how? 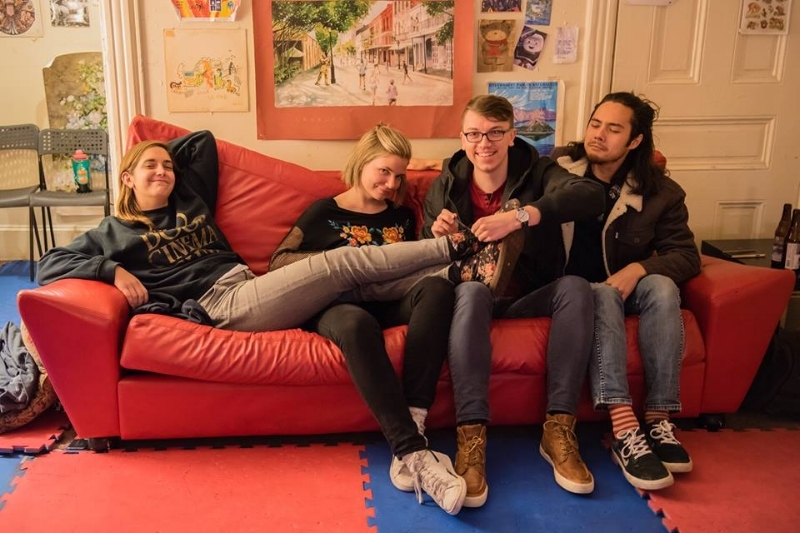 Where is the artist's current home base if not DC : Originally from Northern Virginia, Motion Lines is most active in DC's U street corridor venues but isn't above playing house shows or community events. 2. For our next show, we'll be playing with Fugazi alumni! 3. We were excited to play one of our favorite divey spots, The Velvet Lounge. We were deep into July and it was hot and sticky. We were all soaked with sweat after loading our gear up the Velvet Lounge steps to the second floor where the stage is. We were a little bummed because Ariel Pink was playing around the block at the 9:30 club, and we wouldn't be able to catch the show because of our gig. We had a nice sound check despite loud cracks of thunder from outside and a drippy ceiling. After the place started to fill up, we got the go ahead to take the stage and kick off our set. We picked up our instruments and settled into place. As our guitarist plucked the first note of our first song, the lights went out. A bout of lightening had knocked out the power. Folks were friendly but without AC it soon became uncomfortably hot. The venue offered us warm beer and we chatted in the dark for a bit before realizing we might still be able to catch Ariel Pink's show. We dashed out into the thunder and hurricane winds and scurried up to the 9:30 club only to find they had lost power as well and that droves of disappointed concert goers were flooding the stormy street. Alas, no gig and no Ariel Pink. Oh well. At least 3 interesting/entertaining facts about the band related to persons/events in Washington DC area: Competed with college Acapella group in ICCAS (the Pitch Perfect Competition) the past three years! I can beatbox! Have performed at Jammin Java’s annual Clausterf*** for four years now with many of DC’s top musicians! Avid ugly sweater collector, have thrift store finds for every holiday! Anything else we should know, or you want to share: Last November traveled out to LA and was able to sing for Judy Stakee, who developed Sheryl Crow and Katy Perry! I have one full length album out and two singles! My song “Picture Man” has done very well! Currently recording more music for my next album! I was the videographer for Camp Jam DC this year, and made 3 music videos for the bands! --We didn't really have a band name for the first couple of years playing together. I had a French roommate that was booking bands for a music festival the French embassy hosted. When we were talking about the show, our first one, and what we should call ourselves, and discussing how my roommate got us the gig, it just sounded right. --Brightwood Park. The band started out in a basement in the Brightwood Park neighborhood of DC. We've been there for the last 5 years. We moved out of the basement and into a garage tho. Progress! --Most of us are from the area. I'm from the Eastern Shore of MD. I moved to DC because when I started going to shows, all the bands I wanted to see played in DC. --My biggest dream was to play the Black Cat and we just did that for the first time. --Most of the dudes went to school here. --Jake came close to becoming a professional baseball player. --We re-recorded some of our album at the MLK library for free! --I've served Ian Mackaye iced tea! --We're about to release our second recording in a couple of months! Story behind your band/artist name: We began playing a year ago (and gradually developed our sound) but could not agree on a name. So we used a random name generator as a joke and actually decided we really liked "Mystery Friends" so we stuck with it. It was easier to promote than the "shrug" emoticon. At least 3 interesting/entertaining facts about the band related to persons/events in Washington DC area: - Abby is also a solo recording artist, performing singer-songwriter music and Dave comes from a background in the noise-rock world, so there is a wide variety of influences. - For the last few months, a friend of the band (who is in graduate school for sociology) made us the subject of her paper, studying the ecosystem of a band, how the members interact, how the sound develops, and how each person talks about the music in the group and private setting. She's finished the paper, but we haven't read it yet. So, we are both a band, and a field study. - When we began playing, Robbie owned a bass, but had never played it. - 3/4 of the band members are from the Midwest (St. Louis and Iowa) but are all comfortably relocated to DC. Robbie is born and bred in Alexandria. - Dave's rule for the band from the beginning was no jam band and no cover band, and so far this rule has held. - Band practice initially was just an excuse for 3 of us to meet once a week and drink a bunch of whiskey while tying not to get a noise complaint. That gradually focused into actual songs. Anything else we should know, or you want to share: Our debut EP came out summer 2017! Host a music review blog, Glory In Sound focusing on showcasing local musicians and reviewing bands. Anything else we should know, or you want to share? : I got bitten by a fish once. Recommended if you like: Sade? Story behind your band/artist name: Every time one of us would suggest a name, one of us would say "nah" so finally someone suggested "nah" and it stuck. What part of the DC region is the artist tied to and how? Where is the artist's current home base if not DC : We spend a lot of our time on U street in NW and in Adams Morgan. We all live together in Falls Church because we needed a detached house (for the noise) and it's a bit cheaper. At least 3 interesting/entertaining facts about the band related to persons/events in Washington DC area: Our drummer has a drunk alter ego that we call "Jonathan"
We all say the made up word "shmergergon" way too often. We have named the collective conciousness of our band "Althea" and consult her when decisions need to be made. Anything else we should know, or you want to share: We owe a lot of the success of our band to the Tinder app. Story behind your band/artist name: We all moved to DC and started practicing near H st NE, aka Near Northeast, so that's where we got the name! --1) Singer/violinist Kelly met guitarist Avy and founding drummer Alex while performing as backing musicians for a South Asian folk festival at the Kennedy Center. --2) Near Northeast's single "Under the Pines" from debut album Curios (2015), features live shots of Northeast DC (Union Station, Gallaudet University, the Hopscotch Bridge, etc.) and was created by artist Kip Radt, using a combination of stop motion animation, live shots, and stencils. --3) Near Northeast recorded their live video "What to Say" for the NPR Tiny Desk concert outdoors with several feet of snow, after the "Snowzilla" blizzard, at bassist Austin's backyard in Columbia Heights! The song was selected by WAMU as one of their "favorite videos." The song will be featured in their upcoming second album, due in Spring 2017. --4) The majority of their debut album Curios (2015) was recorded in Northeast DC in former drummer Alex's wine cellar, a tiny 12 x 20 foot room, that flooded often and was only accessible through a trap-door from the kitchen. --A DC-based music project, Near Northeast makes melodic-ambient-indie-folksy music, weaving Latin American, Indian, and Appalachian influences together to make a distinctive musical tapestry. The band met while playing a South Asian music festival at the Kennedy Center in Washington, D.C., and released their debut album “Curios” in 2015. Their sound, built around guitar, violin, and double bass, mixes ballads with dynamic soundscapes, vocal harmonies, drum machines, and the occasional melodica and cajon breakdown. They are currently at work on their second album, due out in spring 2017. Story behind your band/artist name: During the first attempt at producing my debut EP, I went to visit my dad in the hospital shortly before he died. I told him I didn't like my real name for selling records, and he said I could use "Nina Hart", (my great aunt's name; she was an opera singer in New York City.) I liked the idea of taking on my great aunt's name because it reminded me of how the "Black Canary" title is handed down through the generations. I decided to make "Nina Hart" my own by adding an "e" to get Nina Heart, a name which naturally lends itself to all kinds of marketing potential. What part of the DC region is the artist tied to and how? Where is the artist's current home base if not DC : I grew up in the Washington DC, metropolitan area, and I always loved this city so much. I now reside in Tenleytown. --1. When I was a kid, I used to dance on stage with Fugazi. --2. Ian MacKaye is literally my hero because he stood up for me at a Fugazi show in Albuquerque, NM, when some jerk punched me in the stomach while I was moshing. Ian stopped the whole concert and said, "Hey you, why don't you go home and watch Monday night football instead of punching little girls in the stomach like that?" --3. I'm still too shy to talk to Ian. --Did I mention Don Zientara is playing guitar on my record? --Birth name inspired by Odetta, the amazing folk singer! --3. My partner & producer & collaborator in life, Jack Inslee, is launching a new podcast network in the lobby of the Line Hotel, opening in Adams Morgan this spring.